Can online reviews rebuild trust? In my early years of choosing holidays – those first few I took with friends, instead of relatives – my research only extended to a flick through Teletext, or peering into the window of a high street travel agent for cheap package deals. Okay, so I knew roughly where Corfu was (very roughly...), but I didn't really know what to expect when it came to vital factors such as hotels and restaurants. You know, those little things which can make or break a trip abroad. Everything has changed in the last decade, however, with the explosive growth of review websites such as TripAdvisor. Even if you don't visit the site directly, a quick search via Google for hotels in most locations will point you in its direction within the first page of results. For many travellers, TripAdvisor has been an invaluable breakthrough, helping them to make an informed choice about where to visit. Featuring over 50 million reviews from its community of users, it is hugely influential and also a very useful online marketing tool for establishments which shine. But cracks have begun to appear, particularly in the last 12 months, with hoteliers moaning about fake negative reviews from consumers – and consumers moaning about fake positive reviews from hoteliers. To complicate things further, some hotels claim TripAdvisor has damaged their business by unfairly accusing them of cheating and applying 'red flag' status to their profiles. One hotel in Evesham is even taking legal action; while the Advertising Standards Authority has investigated the site's processes. How to police internet comments? TripAdvisor has recently changed its strapline from 'Reviews you can trust' to 'Reviews from our community', which many suspect is a bid to avoid further accusations of misleading consumers. However, it does seem a shame that an essentially great idea should be derailed by problems affecting what is so far a relatively small percentage of reviews. The real question is not whether online review websites have any validity in principle, but how they can tackle these challenges and move forward in a way that is helpful for everyone. Is there a way to restore consumer trust in internet assessments? 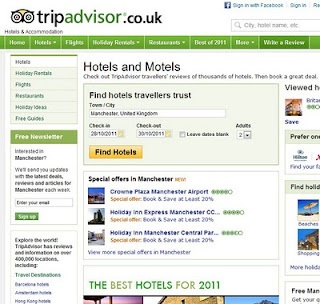 TripAdvisor already gives business owners a right to reply to negative reviews, and checks internet protocol (IP) addresses to make sure that reviews are not submitted from hotel premises – but many feel that it should go further, perhaps requiring proof of a stay to allow a review to be submitted. Many are also suspicious of the thoroughness of the checking processes used, which is unlikely to change just because more rules are added. Regulation may be the answer. Last month, Marketing Week reported that technology retailers and manufacturers have launched a manifesto agreement, created by consumer company Reevoo. It applies a logo to the websites of businesses that have signed the manifesto, as a sign that the review publishing processes of those companies do not feature biased or fake user comments. High-profile participants include Best Buy, Sony and Jessops. If a manifesto was introduced for leisure websites such as TripAdvisor, Yelp and TravelPost , including a transparent approach to its systems, perhaps some faith would be regained.